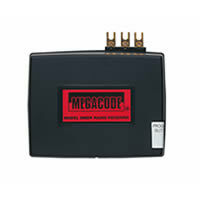 The MegaCode series of digital receivers are wireless radio controls designed for us with automatic gate openers. The MegaCode radio format provides unparalleled security. The transmitter and receiver can be programmed to more than a million different codes. MegaCode receivers and transmitters do not contain a typical “coding switch”. Each transmitter is pre-set at the factory to a unique code. The receiver is programmed by sending a signal to it from the transmitter(s) that are going to be used with it. This stores the transmitters code into the receiver’s memory. The receiver will retain its memory even without power. The receiver will activate only from these “memorized” transmitters. Each MegaCode receiver can remember a maximum of 10 transmitters. Receivers are normally powered with 24 volts AC/DC from the gate operator. The SMDRG has a built-in type “F” connector and is supplied with a 9 inch local antenna. The Linear EXA-GP Remote Antenna may be used to enhance the operational range of the SMDRG. High gain superheterodyne model – Linear’s longest range (up to 150 feet). High RFT immunity – ideal for noisy environments. Stores up to 10 transmitter codes. Supplied with F-connector, whip antenna, and mounting bracket.